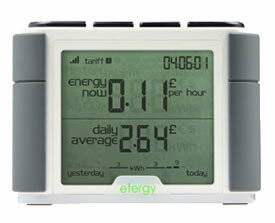 efergy electricity monitors are simple to install and use. The sensor wirelessly sends information about the amount of electricity you are using to the display monitor. The monitor converts this into kilowatt-hours, the standard unit which the electricity company uses to charge you. This shows how much you are using in the same units that are on your bill. Input the amount your energy company charges you for each kilowatt-hour and you can see how much you are spending in electricity instantly. Make instant changes to save money, energy and the environment.